Tube Pump can be mounted in any direction. Suited for liquids of low to medium viscosity, self-priming, compact Model TPU tube pump utilizes chemically resistant tubing materials and peristaltic pump head technology. Four stainless steel rollers (eight roller option is available) minimize pulsation and promote long tube life. Pump features sturdy occlusion wall and back plate and fixed rpm ac gear motors. Tubing ID offered are 1/8, 3/16, Â¼, or 5/16 in., each with 1/16 in. wall thickness. 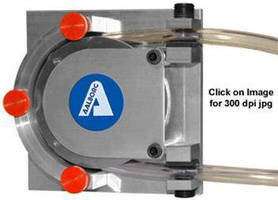 Peristaltic Pump provides flow range from 1.56-457 ml/min. Peristaltic Pump offers pressure capabilities to 100 psi. Peristaltic Pump integrates stepper motor for accurate dispensing. Peristaltic Pump delivers flexibility, purity for biopharm sector.